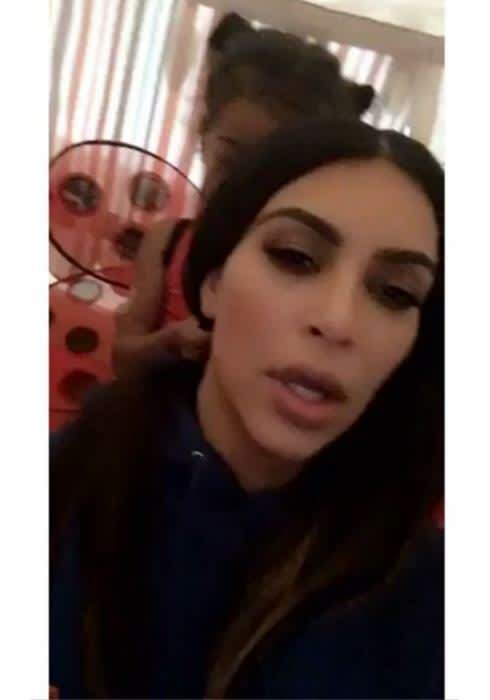 North West braids mum Kim Kardashian's hair in cute new Snapchat video | HELLO! Kim Kardashian only recently joined Snapchat. But the reality TV star is already a sensation on the social media channel, sharing glimpses into her celebrity life and videos of her adorable children North and Saint West. And the 35-year-old melted fans' hearts on Tuesday when she shared a cute clip of her toddler North braiding her mum's hair. Kim has been rocking braids of late and her love of the hair style appears to have rubbed off on North. In the video, Kim is sitting down with her daughter behinds her and asks the tot: "What do you want?" "I want an... a braid," replies North before she starts playing with Kim's brunette locks. "You're doing my hair?" Kim asks, to which North says "yeah". In another Snap Kim shows off her daughter's latest adorable outfit - a ladybug princess look complete with spotted fairy wings. Clearly every day is fancy dress in the Kardashian-West household; Kim's husband Kanye, 38, recently shed his cool rapper image and turned into the Easter bunny to impress the kids. He and Kylie Jenner's boyfriend Tyga, 25, attended the family celebrations last week in the hilarious outfits. Of course the moment was shared on Snapchat, with Kim saying to North: "The Easter bunnies have shown up! Look! I wonder who's in there." Although Nori seemed initially weary of Kanye and Tyga, she sooned warmed up to the idea and was high-fiving and hugging her dad. With fashionista parents like Kim and Kanye, it's no surprise North loves getting dressed up. Last year Kim opened up about her daughter's love of fashion and make-up, confessing she's 'the ultimate girly-girl'. During an interview with Elle, Kim said: "She's obsessed with make-up and watching me getting ready and getting ready herself. She just loves the process."